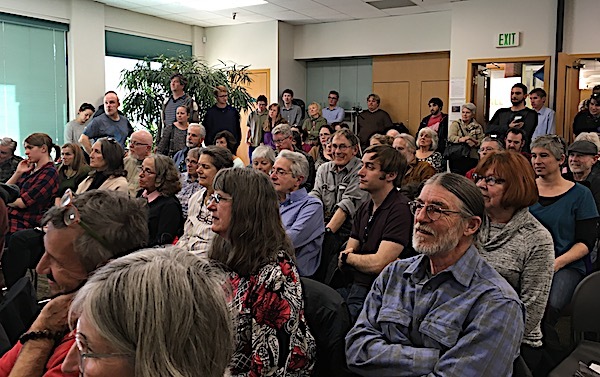 A packed crowd at a Meadows Branch library meeting room Sunday, Jan. 7, discovered that there are at least four pretty decent candidates to take over Rep. Jared Polis’s 2nd Congressional District seat being vacated by Polis as he runs for Colorado governor. 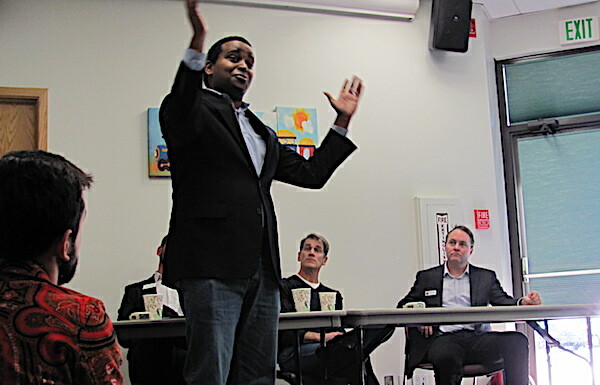 Joe Neguse, who’s widely regarded as the local Dem Establishment’s chosen heir apparent, and who spoke in polished, spirited and reassuringly progressive terms, has racked up numerous endorsements from center-left Democrats, but has inspired skepticism among more left-purist local activists, partly because he is accepting corporate PAC money. Mark Williams, a former Boulder County Dems chairman, appears the more ideologically pure choice for veterans of Bernie Sanders’s presidential run. Williams has vowed to accept no PAC money, earning him strong support among participants in Our Revolution Boulder, the Sanders-linked activist group that organized and hosted Sunday’s meeting. Williams pointedly mentioned Neguse’s already having accepted campaign dollars from Holland & Hart, the super-Establishment Denver law firm where Neguse was employed for six years (a resume item mentioned on Neguse’s LinkedIn page but not, at this writing, on his campaign website). Just as interesting at the meeting were comments by the other two candidates. Kristopher Larsen, who is Nederland’s current mayor and a scientist, was particularly strong in his critique of fracking. And Nick Thomas, who’s running as an Independent, noted that CD-2 voters are registered as Independents in greater numbers than either Democrats or Republicans, and they ought to consider electing an Independent (like Bernie) free of the “tribalism” of two-party politics. The meeting room, which overflowed into the halls with close to 300 attendees, was itself noteworthy, since the meeting was apparently promoted only via social media with not a peep from local newspapers. Our Revolution organizer Drew Romano, who emceed the event, promised that the group hopes to hold more such Congressional candidates forums — next time, in a larger room. UPDATE: Candidate Larsen, like Williams, said that he will not accept PAC contributions. – Ed. Interesting. Looks like there are some good candidates, but why no women? Yeah, the same thought crossed my mind. And it’s not for lack of good prospective candidates of the female gender. Sigh.